"Metadata panel" shows you all the useful existing keys. 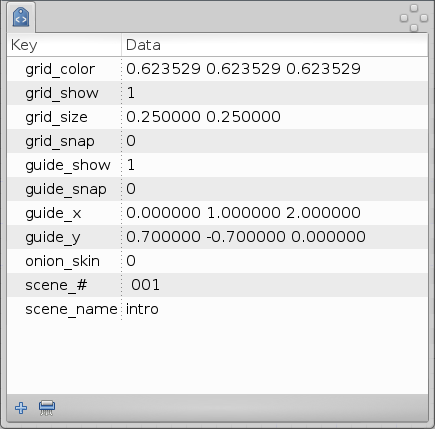 A few number of keys are created and stored for each new canvas like "grid_snap" or "guide_show". The "grid_color" key expect three values for red, green and blue between the range [0,1] separated by a space (for example "0,5 0,5 1" will set a light blue). The "guide_snap" key stores whether snapping to guides is enabled or not. It stores "0" if snapping to guides is disabled or "1" if snapping to guides is enabled. "background_first_color", Checker background first color, expect three values red[0,1] green[0,1] blue[0,1] for example "0,5 0,5 0,5"
"background_second_color", Checker background second color, expect three values red[0,1] green[0,1] blue[0,1] for example "0,1 0,1 0,1"
The units used in the "Metadata panel" for "guide_x", "guide_y" and "grid_size" keys, are Synfig units. You can add more personal keys but not useful for the program functionality. For example you can add the scene number or the author there, but they just will be stored in the file but not used by the application. This page was last modified on 8 February 2015, at 14:14.